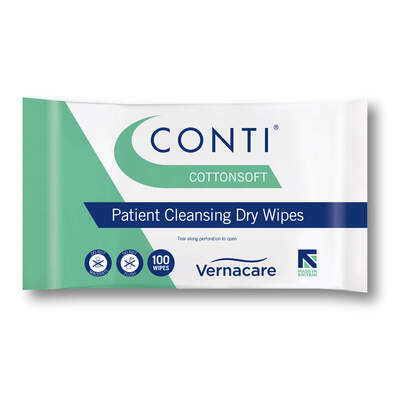 Manufactured by one of the leading brands in patient cleansing, the Conti Cotton Soft Large Dry Wipes have been developed for everyday use. These soft patient wipes have been cotton enriched for a sensitive touch on all your patientâ€™s skins while their heavy duty design is perfect for cleaning up heavily soiled skin. Used by NHS professionals for over 30 years, each of these wipes unfolds to a large 300 x 350mm size providing a vast surface area and making them an economical choice for busy care homes or medical environments. Presented in a protective pack that keeps all your dry wipes protected before use, these delicately Conti cotton soft wipes provide a hygienic and sensitive option for skin that flares at the sight of chemicals or perfumes. Wipe dimensions: 300 x 350mm approx.